This Golf GPS Band is just what you need when on the course as it ensures that you have the critical measurement at all times. It a sleek and lightweight GPS that comes with more than 35,000 preloaded courses and it can measure distances to the back, front, and center of the green. The band has an Auto Course/Hole Recognition, Shot Measurement and it only weighs an ounce. You also get to choose between blue and white for the color of your band. 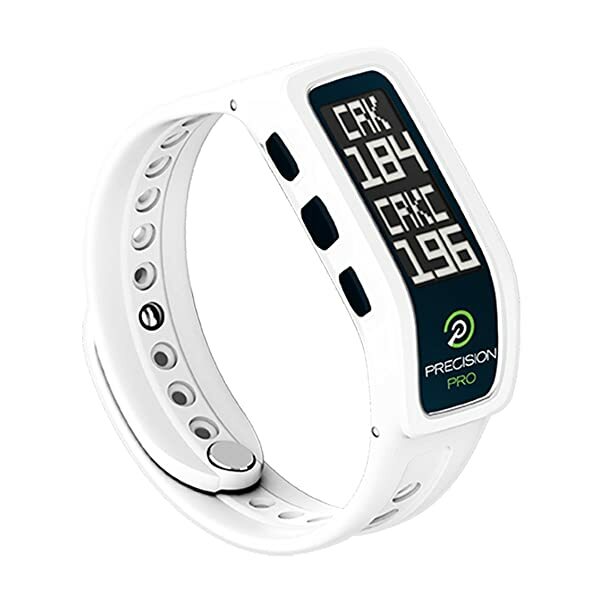 The Precision Pro Golf GPS Band is just what you need when on the course as it ensures that you have the critical measurement at all times. It a sleek and lightweight GPS that comes with more than 35,000 preloaded courses and it can measure distances to the back, front, and center of the green. The band has an Auto Course/Hole Recognition, Shot Measurement and it only weighs an ounce. You also get to choose between blue and white for the color of your band. Preloaded Courses: This device might look small and unsophisticated, but the impressive part about it is that it comes with more than 35,000 preloaded courses from different regions of the world. Distances Measured: It can measure distances to the back, front and center of the green and also up to four hazards for each hole. Auto Course/Hole Recognition: Regardless of what part of the world you are playing from, the GPS with recognize the course and also the next hole and advance automatically. Shot Measurement: The shot measurement feature is an excellent addition to this device. And this is because it lets golfers know how far they hit the balls so as to determine what they need to improve and the club to use. Weight and Dimensions: This band has a sleek and thin design, and it only weighs 1oz while its dimensions are 4 x 4 x 4 inches. 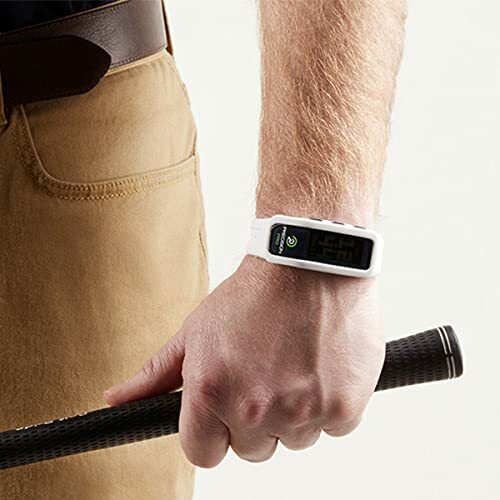 The comfort and lightweight that you get from this device are the two things that most golfers seem to love about the band. But, the greatest benefit that you get from it is reliable and accurate information that you can use to improve your game. The long battery life and ease of use are also some other benefits that you get from this GPS. It is very comfortable to wear even for extended periods of time. You always get instant yardages regardless of where you are on the course. The golf GPS is so lightweight, and you will even forget that you are wearing it. Golfers can still use it as a pedometer or regular watch. It is waterproof meaning you can use it in any weather. The small battery allows for recharging, and it lasts for long. This golf GPA is USGA legal (you can use it in tournaments). The display is adequately bright and easy to read. Set up is easy and using the device is also effortless. Charging part can be annoying and frustrating. You will not get an exact yardage to the holes. Going through the different modes is quite tedious. It is hard to enjoy a modern game of golf without a GPS because it is what gives you all the necessary measurements. 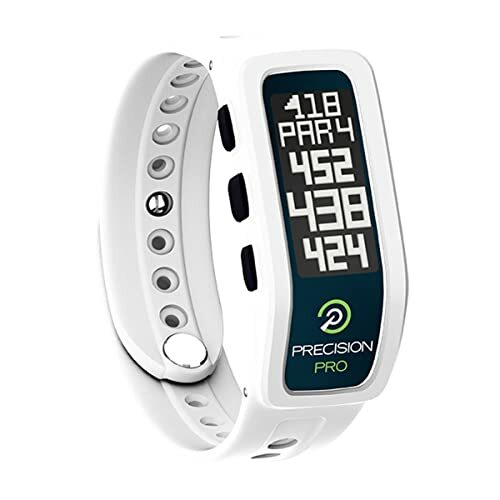 Whether you are a newbie or pro, the Precision Pro Golf GPS Band will work for you. It is a lightweight device that is also very comfortable on the hand, and you will hardly even notice it is there. Everything about it is just fantastic, and you can expect many advantages such as an easy to read screen, a long-lasting battery, and waterproof feature for use in any weather. But, some customers also complain about the charging being frustrating and the device failing to give you exact yardages to the holes. However, the bottom line is that it is an excellent tool that you can rely on when in the course.